We had an excellent turn out for our Space Camp with 21 Cubs, 9 adults and 2 young leaders! We stayed in the luxurious Centenary Lodge at Youlbury (ensuite bathrooms for every Cub room!) and made the most of the fantastic facilities. Camp began on Friday evening with the Cubs forming into crews (Pioneer, Apollo, Sputnik and Vostok), receiving their log books and then creating their team flags, before settling down to sleep (in the end ...) on their planets. After a rather early start from some teams, we began Saturday with a delicious breakfast of bacon and eggs before the teams completed their four NASA training bases - communication, code breaking, space bridge and asteroid field. They were then awarded with their crew badges and refuelled before beginning their programme of astronomy training. Over the course of the afternoon they learnt about the planets in the solar system, forming a giant human model outdoors and then drawing diagrams (as well as hearing the fantastic solar system song for the first, but most definitely not the last, time). They also found out about some of the work which is carried out at RAL, just down the road from where we were staying. They learnt about the differences between stars and planets and played a game to test what they had learnt. They found out about constellations and made some of their own (which glow in the dark!) They learnt about how to observe the sun safely and how the Earth moves around the sun. And they found out all about the features of the moon. We also made silvery flying saucers out of tennis balls and CDs and the Cubs carried out research in their groups into topics of their choice. And we had a very blustery rocket-firing competition. On Saturday evening we had an indoor camp fire, with toasted marshmallows. Unfortunately it was too cloudy to look at the moon. The Cubs were all thoroughly worn out and went to sleep fairly quickly on Saturday night, with the leaders following not too far behind! 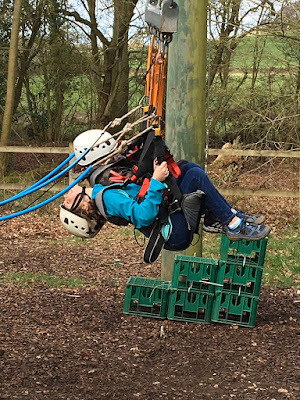 Sunday was a a much sunnier day (we were even able to safely observe the sun with our special glasses) and after breakfast and inspection of quarters we did a bit of flight training, with a zip line and a 3-G swing. We then returned to base for a quick refuelling before finishing off and rehearsing our presentations. After lunch the Cubs completed their final exams in their teams. The parents then arrived and were given eight amazing presentations about space and an excellent rendition of the solar system song. The winning crew, Pioneer, each received a "Space" DVD and every Cub received a giant Astronomer badge and certificate.